At long last, it’s finally arrived. 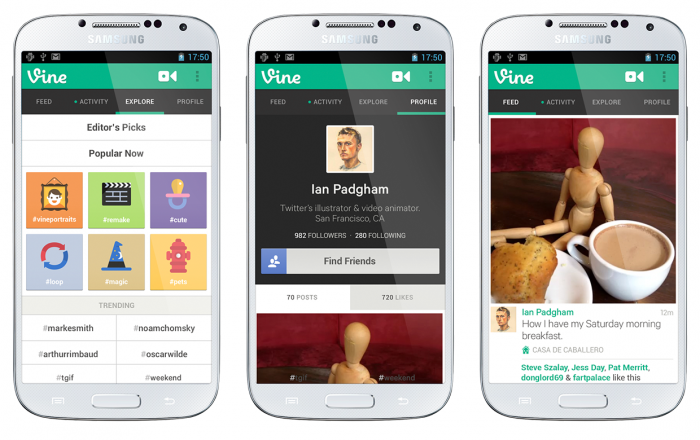 Twitter launched Vine, its popular video-recording and sharing app, on Android today as it passed 13 million registered users worldwide. It includes much of the same functionality as the iOS version, allowing users to shoot concise, six-second videos that loop automatically on playback and include sound from the handset’s built-in microphone. Recording and editing footage will feel remarkably familiar to anyone that’s experimented with the iPhone app; just tap-and-hold to record, before pressing again to start a new shot. Once the progress meter at the top of the screen is full, the clip is complete and the user is then free to share it on Vine or Twitter (with Facebook on the way, Twitter tells us). The general navigation on the Android version is also pretty similar to the original iOS app. The top of the screen is split into four tabs: Feed for viewing the latest clips from people you follow, Activity for recent notifications, Explore for discovering new content and Profile for reviewing your prior uploads. It’s simple, clean and carries the same design consistency already established in its iOS app. Twitter has admitted, however, that the iOS and Android apps “are not perfectly in sync”. Missing features will undoubtedly be a disappointment for some, but it’s perhaps justifiable given the plethora of updates that have gone out for the iPhone version since its launch back in January. This includes support for the iPhone’s front-facing camera, trending hashtags in the Explore section of the app and Web embeds, among others. The ability to zoom-in, however, is an exclusive feature that Twitter has rolled out for Android users today as a form of peace-offering. Hopefully it’ll come to iOS in a future update. Twitter has also promised to update the Android version with multiple updates “over the coming weeks”, including support for the front-facing camera, better search functionality and the inclusion of hashtags and mentions. The app released today is very much a first draft then. Nevertheless, Android users should be overjoyed that one of the most popular and sought-after mobile apps has finally arrived on Google’s mobile operating system. It’s been a long four months, but the wait is finally over.